Members of OFFC only and must have current EA Licence. No non-members allowed on this water. Members may only use 1 rod. No more than 4 anglers on water at any one time. If all rods are taken then 4 hour rule comes into operation. Fishing Slots are timed at 4 hours for this trial year. Members cannot book more than one slot per day but can use more than one slot if no-one else is waiting. Members must sign in on arrival using signing in book provided. After fishing members must sign out and enter catch return. You fish at your own risk. Signing in book is kept on a bench in a former Portaloo marked OFFC on right hand side of farm driveway. Fishing to start no earlier than 8.00 a.m. and finish at published sunset time plus 30 minutes but no later than 10.00 p.m.
Members may use the working portaloos on the site. Fishing on the River Tame is now open above and below the Road Bridge as we have reached an agreement with both new owners for left bank fishing from the fence above the weir downstream to the footbridge below the Road Bridge near the Cricket/Bowling Club – about 900 yards in all. The upper stretch runs from the road bridge upstream beyond the weir to the top fence in the long field. It is reserved for Members only – no guests allowed on this stretch. The long field – about 600 yards – will be planted for crops so members must keep to the river bank on their way to the upper stretches. The first short part of the field immediately above the bridge will be grazed and may be used for events like the Saddleworth Show (this year on Sunday 2nd July). We have this water on a probationary basis and the permission granted to the club can be withdrawn. Access The main entry point to this stretch will be through a gate on the road on the right hand bank (looking upstream). It will also be accessible by wading under the bridge from the Walsh stretch. Take care under the bridge – the water is deep in parts here since floods two years ago washed out some of the foundations of the bridge. Parking for this stretch is in the designated space at Well-i-Hole Farm. Four parking spaces are available through farm gate (Green Well-i-Hole sign) and then left through a second gate down into the field. Spaces are facing OFFC sign close to the fence and the wall. Permit Disc (Kept in the OFFC hut) must be displayed on dashboard and members must be visibly displaying OFFC badge when fishing. Jack the Site Manager lives in the first caravan which overlooks the parking spaces. The Signing in book is kept on a bench in the former Portaloo marked OFFC on the right hand side of the farm driveway. There is a combination lock on the Portaloo the number of which is 5423. 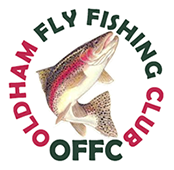 Members must sign in before fishing and sign out after completing a catch return and before leaving. Four hour rule applies. The Rules, OFFC Health and Safety Policy and subsequent notices are kept in this book and should be read before fishing. Fishing to start no earlier than 8.00 a.m. and finish at published sunset time plus 30 minutes but no later than 10.00 p.m.. You fish at your own risk. Catch and immediate Release only. No fish to be kept in nets. Maximum 4 fishermen on this water at any one time and the four hour rule will apply until we see how things work out. The lower stretch extends from the pool below the Road Bridge down to the footbridge – some 300 yards on the left bank. The fish are small – mostly 4” – 9” – but free rising and give good sport to light tackle. We are limited to four rods on the whole stretch at any one time and to accommodate this we have a four hour rule, but, unless visits increase massively, that should not be a problem and, if it is, we will look at it again. We have had to agree to two guest tickets, on the stretch below the bridge only, for residents at the Caravan Park but again this is not likely to be much used. If there are Well-i-Hole Guests on the water they will have a numbered Guest ticket (which they have paid for) and their details should be in the signing in book just like members. Access The main entry point to this stretch is through the last gate on the road before the bridge on the left hand bank (looking downstream) which leads down to the pool below the bridge. (A pool which takes water from the Royal George Lodge). The key of this gate is kept in the OFFC hut. If you wish to use the lower stretch gate then please keep the key with you but secure the gate with the chain so that other members can get through. Lock the gate when you leave the stretch and return the key to the OFFC Office . Jack has a spare key. If these details change then that will be in the notes kept inside the OFFC Office. Parking for both stretches is in designated farm area only. Four parking spaces are available through farm gate (Green Well-i-Hole sign) and then left through a second gate down into the field. Spaces are facing OFFC sign close to the fence and the wall. Permit Disc (kept in OFFC hut) must be displayed on dashboard and members must be visibly displaying OFFC badge. Farm Guests must have Tickets with them and show them to Bailiffs when asked. Jack the Site Manager lives in the first caravan which overlook the parking spaces. The Signing in book is kept on a bench in the former Portaloo marked OFFC on the right hand side of the farm driveway. There is a combination lock on the Portaloo the number of which is 5423. Members and W-i-H Guests must sign in before fishing and sign out after completing a catch return and before leaving. Fishing to start no earlier than 8.00 a.m. and finish at published sunset time plus 30 minutes but no later than 10.00 p.m. You fish at your own risk. Maximum 4 fishermen including 2 W-i-H Guests on this water at any one time. Four hour rule applies to OFFC members. See below for details of W-i-H Guest Tickets. Price £5 per day – available from Site manager Jack. The water is rented to and run by OFFC. The stretch extends from the pool below the Road Bridge down to the footbridge – some 300 yards on the left bank. The fish are small – mostly 4” – 9” – but free rising and give good sport to light tackle. Fishing to start no earlier than 8.00 a.m. and finish at published sunset time plus 30 minutes but no later than 00 p.m. You fish at your own risk. Maximum 4 fishermen including 2 W-i-H Guests on this water at any one time. The signing in book is kept on a bench in the former Portaloo marked OFFC on the right hand side of the farm driveway. There is a combination lock on the Portaloo the number of which Jack has. Members and guests must sign in before fishing and sign out after completing a catch return before leaving. Number of fish caught,,,,,,,,,,,,,,, Size……………. Comments………….